Gaming fan, collector, former Sierra employee and Youtuber Metal Jesus, visited the home of Al Lowe, best known as the designer of Leisure Suit Larry. In the video, shown below, Al shows off a bunch of extremely rare and often unique material from Sierra, including the first games he developed pre-Sierra under his company name Sunnyside Soft, such as Dragon's Keep and Bop A Bet, later re-released as educational Sierra titles, and an original copy of Gelfling Adventure, a spin-off of The Dark Crystal, as well as other Disney titles. The crown piece however is a box containing the original source code of various Larry games and even of King's Quest III, which Al also programmed. Al decided to keep these disks as he was aware that Sierra did not keep any backups of them at the time. The most astonishing news however is that Al decided to list all these items on eBay. As an avid collector and archivist myself, I sincerely hope that whoever wins the auctions will be sharing some of it with the community, rather than stashing it in a collection and let it collect dust over the years. That said, you'll need a pretty hefty penny to be able to win any of these items. At the time of this writing the source code for Larry 1 and Larry 2 already have bids exceeding $8,000 each and the first release of Bop-A-Bet has exceeded $7,000, so with the current listings ending on December 10, it is not unlikely these items will beat the eBay record achieved by the sealed Ultima: Escape from Mt. Drash of nearly $10,000, achieved earlier this year. Currently only six items are up for auction and many more are expected. We will update this post as the auctions proceed. Item description: This is the original disk that I used to create one of the early Sierra Christmas Cards, disks that were originally sent to friends and family of the company, and in later years, were made available to the public. Since I don't have a way to read this disk any more, I can't tell you what year it's from. All I know is: I worked on the first one and didn't work on any after that, so this has to be early on! Since it's lettered in my handwriting, I suspect this is the disk that was used to create the master disk. It's a little bit of history that many of us remember fondly. How many game companies give away Christmas gift disks? Item description: This is not just a 32-year-old computer game disk; it's the disk that inspired me to create Leisure Suit Larry! In 1986, I was looking for a new project and asked Ken Williams what he wanted from me next. He mused about how Softporn had been a huge hit in the early days of Sierra. At a time when Apple had only sold 100,000 Apple ]['s, Ken had sold 25,000 copies of Softporn. And everyone I knew had a pirated version! It's safe to say it was the most popular game of the period. Heck, when Time Magazine began to cover home computers, half of their first section was about Softporn. It was a big deal. Ken wondered if I could "bring it up to date" by using Sierra's new AGI engine. I said that, while I had played it back in its day, I couldn't remember much about it. He gave me this disk and sent me home to play it. I did. I reported back to him that "this game is so out of touch it should be wearing a leisure suit!" and got a big laugh from everyone in the room. I continued, "The only way I could do this game is if I could make fun of it. Make it a comedy." Since I was going to create the new game on spec, with no advances, he agreed. Wait. What? Did I just volunteer to create a comedy computer game? At a time when I could count all the funny games I'd ever heard of on the thumbs of my hands? Yep. And that's how Leisure Suit Larry was born. And now you have the opportunity to own the disk that made Larry possible. This is that disk, the one Ken gave me, the one I played and didn't think could be remade, the one that birthed Larry Laffer. Sure, there's no box � because I didn't get a box. But you get a unique piece of video game history! This is a 5.25-inch floppy, with the old "Sierra On-Line,Inc Mudge Ranch Road" label, complete with Sierra's then-phone number and its Telex number. (You kids can look that up on Wikipedia.) It's inside a genuine brown Sierra On-Line, Inc Tyvex sleeve, complete with handling and care information on the back. The copyright date is 1981, which was when the original Softporn for the Apple ][ came out. Item description: Bop-A-Bet is an extremely rare, 1982 Apple ][ educational game from Sunnyside Soft, the software company that I created along with my wife and the MacChesneys. My second game, I wrote it in my home office, before our new daughter took it away from me for her bedroom, relegating me to code in our laundry room. Sunnyside Soft sold these games out of our home (yes, that's our home address and telephone number on the packaging) for a few months in genuine zip-lock baggies(!) before Sierra bought the rights and repackaged it in their boxes. Only 200 copies of this version were made and all were sold, except this one copy, numbered "18," which I've lovingly stored for 36 years! I'm sure it's the best-preserved example on Earth! This game is complete (see the photos) and in excellent condition for its 36 years. It includes the game disk in its original "Elephant Disk � 'Never Forgets'" sleeve, the parent's guide and a genuine Sunnyside Soft registration card. Those disks came in bright yellow boxes, which I saved and used to archive other games. See my other auctions here for LSL1: Leisure Suit Larry in the Land of the Lounge Lizards and LSL2: Leisure Suit Larry Goes Looking for Love (in Several Wrong Places) source code. The front of the package says that this game requires 48KB of RAM. If you have less than that, please don't bid! Otherwise, "bid early, bid often!" And DOS 3.3 refers to Apple DOS. Bop-A-Bet was also released in a Sierra box in 1983, but even that version is extremely rare. It was never a big seller and I doubt you'll find another copy for sale. This may be your only chance to add this game to your collection. As always, I'll autograph it for you, if you want. Or not. Your call. Item description Dragon's Keep is an extremely rare, 1982 Apple ][ educational game from Sunnyside Soft, the software company that I created alongwith my wife and the MacChesneys. My very first game, I wrote it in my home office, before our new daughter took it away from me for her bedroom, relegating me to code in our laundry room. Seriously. Sunnyside Soft sold these games out of our home (yes, that's our home address and telephone number on the packaging) for a few months in genuine zip-lock baggies(!) before Sierra bought the rights and repackaged it in their boxes. Only 200 copies of this version were made and all were sold, except this one copy, numbered "016," which I've lovingly stored for 36 years! I'm sure it's the best-preserved example on Earth! This game is complete (see the photos) and in excellent condition for its 36 years. It includes the game disk in its original "Elephant Disk � 'Never Forgets'" sleeve, the parent's guide and a genuine Sunnyside Soft registration card. Those disks came in bright yellow boxes, which I saved and used to archive other games. 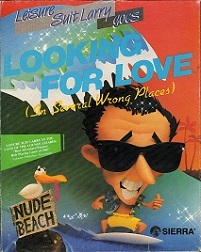 See my other auctions here for the source code to LSL1: Leisure Suit Larry in the Land of the Lounge Lizards and LSL2: Leisure Suit Larry Goes Looking for Love (in Several Wrong Places). The front of the package says that this game requires 48KB of RAM. If you have less than that, please don�t bid! Otherwise, "bid early,bid often!" And DOS 3.3 refers to Apple DOS. Dragon's Keep was also released in a Sierra box in 1983, but even that version is extremely rare. It was never a big seller. This may be your only chance to add this game, in its original packaging and in mint condition, to your collection. As always, I'll autograph it for you, if you want. Or not. Your call. When Leisure Suit Larry sales were strong and my royalties exceeded my greatest dreams, I convinced my wife that if we bought a new Lexus LS-400 I would "drive it till it drops!" She consented and we got a wonderful car that deserved custom plates. These are those. But my line to her ended up being a lie: that car outlasted me! It was still in great condition fifteen years later when my son needed a car and I "needed" newer technology. I replaced it with another LS. At least, it was a different color. Since the two plates are identical (except for the year stickers on the rear plate), the highest bidder gets first pick and the second highest gets the other. As always, I'm glad to autograph it for you if you want. Or not. With several days to go, the auctions of the source code of Leisure Suit Larry 1 and 2 have been canceled. The bids on each of them had already exceeded $11,000. There's something fishy about this and it would be interesting to know the reason for the cancellation. Did the IP owner contact Al, perhaps? An article in PC Gamer explains why the auction on the Leisure Suit Larry source code had been canceled. It turns out that Activision, despite not being the owner of the Larry IP, contacted Al by letter, demanding the auctions to be canceled with the reason that the source code probably contains "shared code" that's also present in the King's Quest and Space Quest games, which Activision does own. Although Al believes he's in the right legally, the costs of fighting Activision's takedown demand would likely be more than the auctions would bring in, and hence the auctions were taken down. Needless to say that this news did not come across well to the Sierra fans who expressed their disgust with Activion's actions. After checking Al's eBay page, it appears that these were all items he decided to sell thus far.